Here is our first update for March! Air France and KLM are sure pushing their Western Canadian flights! 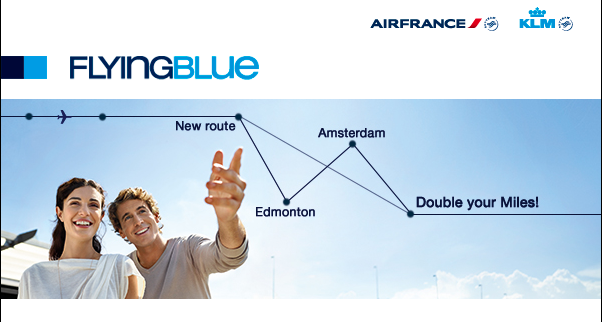 First they offered up Double Flying Blue Miles on Air France's new YVR-CDG flight and now you can earn Double Flying Blue Miles on KLM's new Edmonton-Amsterdam flight! This is a great bonus to take advantage of in the first month of operation if you can't make use of their current Promo Awards offering 50% off Award Ticktes in Business Class. Find out more about the YEG-AMS double miles offer here. Our most loyal guests, Diamond members, will receive complimentary premium Wi-Fi beginning in the second quarter this year at all of our properties when they book directly through a proprietary Hilton channel or via one of our corporate travel partners. Starting in August, we will extend complimentary standard Wi-Fi access to Blue and Silver members when they book their stays directly through a proprietary Hilton channel or one of our corporate travel partners. Complimentary standard Wi-Fi will continue to be a benefit for HHonors Gold members who also book directly through our proprietary Hilton channels or one of our corporate travel partners. This update doesn’t apply to hotels where there is a resort charge. Here are the Rewards Canada's Top 5 Credit Card Sign Up offers for the month of March!